Since the invention of the photographic camera, artists have explored it as a means to stage a false reality, or capture an idea. This can be seen in one of the first staged photographs, Hippolyte Bayard’s Self Portrait of a Drowned Man, 1840. 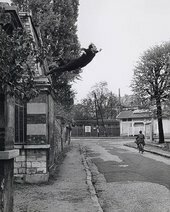 However, the term ‘conceptual photography’ began to be used in the 1960s, coinciding with the early explorations into video art and Conceptual Art. The phrase can refer to any use of photography within the Conceptual Art movement. Using cameras, artists like Richard Long and Dennis Oppenheim began recording their performances and temporary artworks in a manner that is now often described as deadpan. The aim was to make simple, realistic images of the artwork that looked as documentary as possible. Artists adopted this approach as far back as the early twentieth century when Alfred Stieglitz photographed Marcel Duchamp’s readymade made from a urinal, Fountain, for an exhibition in New York. The original Fountain was lost, but the photographs by Stieglitz remain and have become works of art in themselves. Others explored conceptual photography as a means to stage an idea. This is often seen in advertising, where images are used to convey a clear concept, often using actors or props. Conceptual photography has since expanded to include artists such as Cindy Sherman, John Hilliard and Broomberg and Chanarin. For them the medium is much more experimental, taking elements of documentation or staging but re-interpreting them in new ways. The range of photography included under this title has diversified hugely with the availability of photo-editing software such as Adobe Photoshop. This allows anyone with a computer to create an image which is other than a direct representation of what was in front of the lens. Likewise, platforms such as Instagram and Flikr have allowed any smartphone user to share their photography and create entire portfolios of work. Amalia Ulman is an example of one of these photographers; using Instagram to create an entire narrative around a fictional identity.